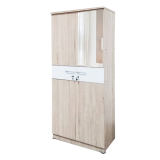 This is a special advantage when buying a custom wardrobe at Lunar Furniture, that is, you choose your own wardrobe material and color. Pay attention to the concept of a house or bedroom so that a wardrobe that is made can look more beautiful and fit. The material and the color itself are many that can be chosen. So don’t ever hesitate to contact 021 54376 555/333 or click www.lunarfurniture.com to get more information. Only at Lunar Furniture can you find various furniture needs that are of very reasonable quality and price. Thanks to his experience in the furniture sector for quite a long time, Lunar Furniture will certainly be a good reference. Most wardrobes usually consist of several parts, for example folded clothes rack, space for clothes to hang, and drawers. If you are the type of person who often uses shelves for folded clothes but has never found a suitable model. The model and shape of this custom cabinet will adjust to the desired function. You have the freedom to set it up and divide it into cubicles, drawers, and how much space is needed. So, you can more freely manage clothes and other items.